Sorry I've been a bit quiet. I've finally had a chance to make serious in roads in to the pile of customer quilting that has been growing since before the Festival of quilts. I had imagined I would come back from the show, take a few days off and quilt up a storm. It didn't quite work out like that. I drastically underestimated the amount of interest a show like that can generate. Thank you all so much for your support it is appreciated, although I am still fighting a loosing battle with my email backlog. I see the end in sight, take a short break and I'm losing again. Oh well. The picture is of one of these customer quilts with a border I am especially fond of. If you haven't entered the Road 2 California quilt show there is still time as they now allow online entries. It's a pretty good system and easy to use. It even checks the resolution of your images for you. I like it a lot, as just preparing and posting the entry was time consuming and expensive. I hope that if it works well for this show others with a lot of international entries might try it too. For those of you who quilt too much, or overuse your muscles in other ways you might like to search the internet for 'Gelli bath'. I'd love to be able to say I saw it and immediately thought of it's theraputic possiblities, but well, that would be a lie. I first saw it in Toys R Us on a quilt related mission (pool noodles). It was aimed at kids and consequently hit me. It looked fun, but when I read the package it was only designed for a very shallow bath. I sulked and bought pool noodles. I later discoved a grown up version, which has lots of very proper words about home spa treatment and all it's benificial effects. All very nice but how much water will it turn to jelly? Half a bathfull, fine, sold. I was initially disapointed the kid in me wanted a really thick bath. The quilter however is thrilled. It has delivered much happer muscles. My shoulders and legs have taken a pounding the last two days and are now happy again. They are right the gel holds heat amazingly and delivers it better too. I don't understand it, but I will be using it again. My very fussy skin even likes it. If you are in Birmingham, 'Bad Rain' will be on display this weekend at the science museum there with BICS. BICS is a comics event and my quilt will be on the stand of Insomnia publications, who published Cancertown the graphic novel it comes from. The creators of Cancertown will also be there along with many other writers and artists. If you've never been to a comics show this is a nice one to start with. It's an interesting venue and a good size event for a first experience. Say hi if you see me. It seems that around London rush hour now runs from about 3.30pm to at least 9pm. It's not getting silly, it's got silly. I am currently sitting a a Polish war memorial with a hot car and a road masquerading as a car par between me and my house. On the bright side I have a dvd player in the car and a new quilting dvd to watch. It is (P)fun - (P)feiling - (P)feathers by Claudia Pfeil. It is designed for longarm quilting machines, but as with most longarm information it can be used on domestic machines too. So far it is all about using formal feathers (aka bump bump feathers), she is showing some great ways to fill space with them. I was initially very disapointed. I've tried this type of feather and I really don't get on with them. The more I've seen of the dvd the more certain I am that the fact they are this type of feather is what I really like about them. So I've come to the conclusion it's time to try again. These feathers do have a different look, I like the look and it has to be more than a year since I last tried. It's not that long ago that I thought I couldn't do any curved feathers so why not these? As soon as I clear some customer quilts I will give it a go. Please, pretty please, if you book me to come to your group can I have the address of the venue. I waste hours trying to workout addresses. It's really hard to get to the right place without an address because although I don't use satnav I do use maps. They work by giving you road names, so if I don't have the road name your venue is in, I struggle. Sorry it's been a while, I wasn't expecting so much life to be waiting for me. My last post was supposed have an illustration. 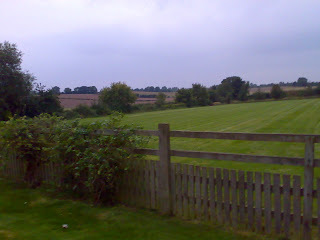 The house where I was staying had an amazing view over fields. For some reason blogger didn't accept it, so I've tried again here. I've also got a picture here of the quilt that I won in the raffle. I'm sorry the colour hasn't come out at all right. In reality it is much more of a soft old gold, but the design is wonderful. Of course being stupid I forgot to write down the makers name, doh!. I am currently in Nottinghamshire teaching and speaking. Yesterday I was teaching 'Art quilts by numbers'for a lovely group of ladies, and today at show and tell I got to see some of the quilts almost finished. I love it when I get to see work from my classes. I will be teaching the same thing again tomorrow, to some ladies I met today. From those I talked to it should be a very lively class. Today I was speaking at region 10's area day. It was an unusual set up. In the morning everyone sat, socialised and stitched. It seemed to be a great way to get to know people and share techniques. That was followed by an excellent faith lunch. There seemed to be almost a perfect amount and blend of food. Then I got to speak. Despite the group being very quiet they were amazingly positive after the talk. However the best bit for me was the raffle. I often buy tickets but usually I'm not really that interested in winning. Today I desperately wanted one of the prizes, but with a large group and 18 prizes to be drawn, there wasn't a great chance. Tet drew the raffle and I promise I didn't influemce it, I won the litte quilt I wanted! I will show you it tomorrow when I will be teaching the lady who made it. She has said she will sign it for me. So can you guess what I have been doing today? I will give you a clue, it isn't quilting, well not directly anyway. Quilts have come from it and I hope that I have the source material for a few more. I guess I should also admit that the title isn't entirely accurate, I haven't seen a train today. I am hoping you will let me substitute a helicopter. It's sort of like a train, isn't it? No, oh well, how about a bike? Sorry they are my best offers. 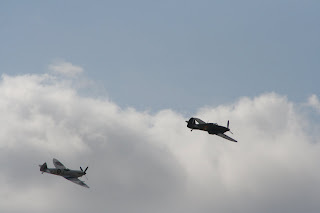 The planes are from the Battle of Britain Memorial flight. The first two to come over were the Spitfire and the Hurricane. I didn't manage to get any really close up shots I'm afraid. When they come over low it is very obvious how fast they are and I just couldn't follow them and adjust the camera quickly enough. They were followed by this helicopter. 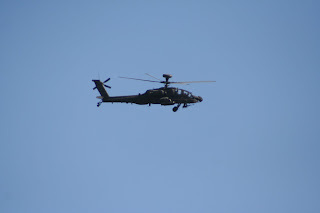 Sorry helicopters aren't really my thing so I will have to leave identifying it to the reader. I am pretty pleased with some of the pictures of it though and I think I might be able to get a pattern out of them. I think any minute now you are going to work out where I am. 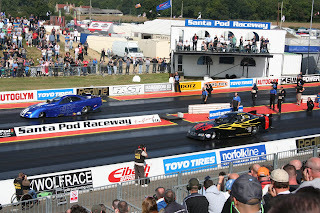 I have spent the day watching the racing at Santa Pod. It's been a lot of fun, and I can't remember when I last watched so much racing. I know I would get bored if I did it every day of every race weekend, but just once in a while it's great. We even had good grandstand seats, which made getting the photographs a lot easier. While this probably sounds like a holiday, and it feels like one, there is actually a serious side to this. I've taken about 700 photographs today to try and get a few more for my car series. 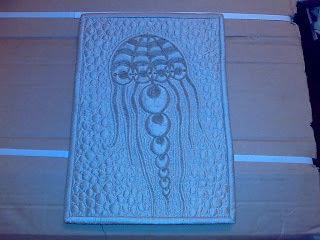 I am also looking for a good image to include in the new art quilt book. I am hopeful that I may have got one today, but I will still try and take lots tomorrow as well. Due to a couple of quite nasty accidents (sore cars, the drivers are fine) the racing ran very late today so I missed out on getting pictures of the Street Eliminator cars. I have a real soft spot for these cars, because they are all street legal. I will be trying very hard to get some good pictures of them tomorrow. I did also mention socks, remember? I was ordering more supplies recently and I came across a DVD on knitting two socks at the same time. It was discounted and sounded strange so I bought it. It is by NenahGalati and it's weird yet wonderful. I liked it enough that I ordered her other DVD's and some needles. I haven't knitted socks on circular needles before so I decided to try one first. Wow! I love the technique. I've managed to knit down to the heel in the gaps in racing today. Normally I wouldn't get past the ribbing in that timescale. I will be doing more socks like this, it's fun. I had planned on showing you my progress on the blog today but we happen to be staying in a hotel with free Internet. If you don't live in the UK you may not appreciate how strange that is. Trust me, it just doesn't happen. Now we know about this hotel we will be staying here again. So as I could show you some of my proper pictures, my sock will have to wait. Sorry. Oh, I've just realized I haven't told you about the cars and bike. 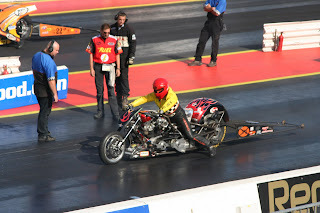 They are, Ian Turbeville on his top fuel supertwin bike, Dan Larsen and Danny Belio in their top methanol funny cars. I always find the first week of term a bit of a shock, and this one has been no exception. New people, new classes and this year new venues. The new people have been great. I feel it's quite tricky adding a few new students to existing classes. Will they jell with the class, will the class suit them, or will they change the dynamic of the class for the worse. So far this year is looking good. I've got very lucky and have some fun people who have joined my classes. I think Wednesday will go from strength to strength. Some old students have returned too, which is lovely. Familiar faces, and names I can almost remember are nice, as is seeing how they have progressed while they have been away. The new classes are coming along. I've almost written the three introduction type chapters for my art quilts book. I am feeling a lot better about teaching that tonight. Of course I can't find half the tools I wanted to photograph, but I don't think that will be a significant problem. I still haven't really got things straightened out after the mad rush for the festival of quilts, and it's all the small things that are hiding. Oh well. My first new venue I don't get to see until next week. Tuesday I will be at 'The Nimble Thimble' in Buckingham. It's a new shop just trying to find it's feet in these difficult times, so if you are in the area, you might like to give it a look. For those of you who find Patchwork Corner too far south this might be your chance to come and join me for a class. This Tuesday I will be teaching machine quilting 1. 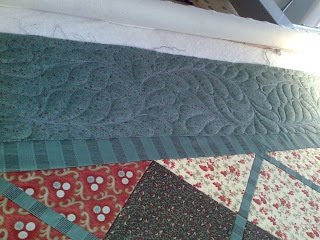 A whole day of playing with different quilting options on your machine. I believe there are still a couple of places left so if you want to join in, call the shop on, 01280 822236. What do flying and quilting have to do with each other? Well that depends on your outlook. Other than the fact that my pilot is a quilter, just look at all the inspiration we found. I met Peter at Patchwork Corner, when he came in with a proto quilt. A stack of blocks made from ties. It looked like it was going to be a lot of fun to quilt and I was thrilled when he handed it over and told me to do whatever I wanted with it. I did and among other things it got a Vulcan quilted on it. I had ascertained during our conversation that he was an aircraft enthusiast so it seemed appropriate. Well it turned out I had underestimated this interest somewhat, he has a plane, and he offered to take me out in it. Of course I said yes, but then work got in the way. It feels like it took forever to get a free day to fly, and then it looked like the weather was going to be against us. At the last minute I got lucky, very lucky. We have fantastic visibility and a cloud layer we could get above. I will admit, that doesn't have as much quilt potential as being able to see the ground, but it's a wonderful place to be. I loved it. For quilt potential though the Norfolk coast provided in bucket loads. I couldn't believe some of the colours we were seeing, and apparently I was seeing it past it's prime. I like the way the light coming through the clouds makes patterns on the ground. It's very much like the effect of quilting on patchwork and I am sure at some point this will get incorporated into a quilt. We stopped for lunch at a pub in Binham. Yup that sounds strange, but it's true. On the way in to land I got a great view of Binham Priory. It's a magnificent building now, but when you go inside it has an artists impression of what the building would have looked like. It was huge. It must have been somewhat intimidating to live near. From here we hopped over to Muckleburgh to a tank museum. I'm going to have to make it back there at some point. It looks quite small from outside, but inside it is a tardis. Tanks, trucks, guns, uniforms and well stuff. Lots of inspiration there. I have many pictures of tank tracks, the patterns in them are wonderful. There was also a Ferret, so here you go, a two ferret photo. I had a lot of fun, and I really can't wait to do it again. So much so that lunchtime today I had great difficulty keeping track of conversation as light aircraft teased me at the quilt shop. In fairness the first class of term was a lot of fun, if a lot of work. The workshop is looking great, and the students were a really fun bunch. I do enjoy seeing how a class progresses with machine quilting. There are always some students who find free motion quilting stressful yet often they are the ones who the other students feel are the most proficient by the end of the day. I also get to see a lot of variations on patterns. Whenever people copy things they change them slightly, and sometimes those changes give you a whole new pattern. Today I got two more, though I have yet to see if they work for me. I think one of them might. Tomorrow I have two classes, with several new students it should be interesting. I have no idea what skill level they are or what they might want to make. I like a challenge. I suppose I aught to try and get some sleep, I suspect I won't be very successful, it's far too hot for me again. Today we had to take the family to a 40th birthday party. We missed most of them due to quilting commitments but this one was too local not to attends. It's a nice day for it, and Trogdor, the race car was even persuaded to start. I hope he will be as keen on leaving. 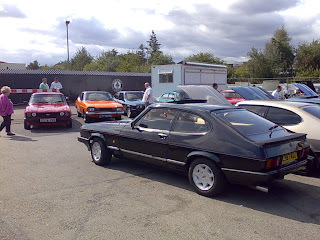 It is so cool to see a car park full of Capris, and I've been window shopping. I know Joker would love a new shiny (and more effective) radiator. The one I really liked even had a URL on it, so later I can scare myself with the cost. To complete the day the Ace Cafe have added free wifi so I can blog while I wait for my food. Wow, work is sort of worky isn't it. I have a stack of customer quilts to work through, which is quite nice, but also a pile of paperwork. Unfortunately every time I try to look at it the phone rings or an urgent email comes in. I am sure I will get through it all but it's going to take longer than I thought. As work is taking up more time than I had anticipated I haven't quite finished putting my holiday quilt together. It is very close though so when I clear the customer quilts I will pop the last borders on and get it on the frame, I am desperate to play with my new threads on it. I also realised today that I have to get writing rather urgently. Term starts next week and it now looks like three of my students will be wanting to use my new book. That's going to be tricky if it is still in my head. The good news for all of those who have been asking for it, is that this will be an art quilt book. It will cover several of the techniques I use to produce my art quilts and at least three specific projects. It might even get published before the other book I have written and ready to go, given how many people seem to really want this book. I suppose rather than writing here I should be starting on it.